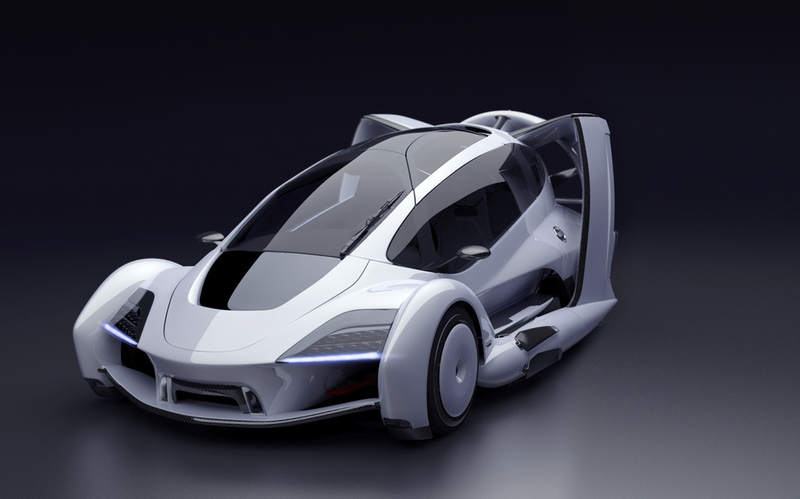 Shaped by the aerospace industry and designed from the automotive vantage point, the Terrafugia TFX addresses very demanding industrial design problems in a way that both is aesthetically appealing and intelligently crafted. The TF-X combines innovative design solutions from both industries into one homogeneous package that is suited for land and air. 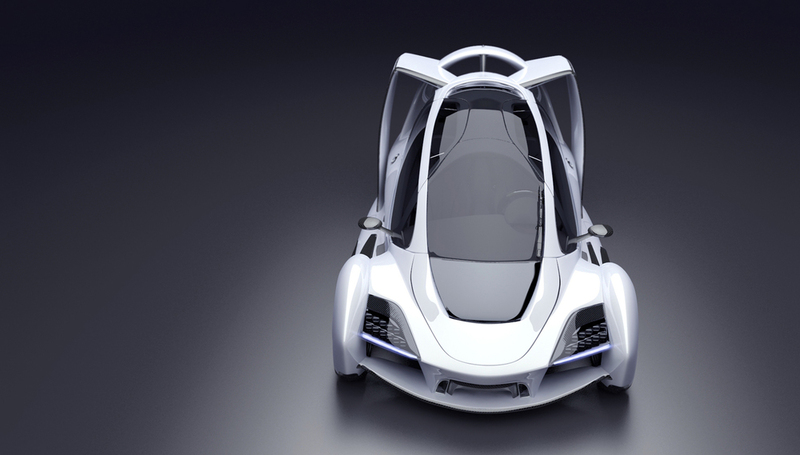 The vehicle addresses the ever changing and always demanding safety regulations from the automotive world while structural and mechanical elements, that Terrafugia have set into it's configuration, allow it to take to the skies. From a design standpoint the TF-X maintains a unique and standout look that indicates motion, speed, purpose and elegance. The windows and front trunk areas create large graphical elements that break up the body work. A critical balance of fitting a vehicle within a highway lane, making it safe to drive, have enough lift capability, and ease of use is key to the design. Critical elements that have been translated from Terrafugia's rigorous exploration in how this vehicle traverses land and air include elements such as the twin 600hp electric motor pods mounted to the folding wings and the compact 300hp engine mounted behind the passenger compartment that powers the rear wheels and the large forward thrust fan. The conventional engine is mated to a trans axle which eliminates an extra drive shaft and differentials in the front of the vehicle. Locating the engine aft the passenger compartment, or at the CG of the vehicle, assist with weight distribution front-to-back, minimizes prop shaft length and weight, and provides optimal forward sight angles because of the lower front trunk. Cooling is managed by frontal water and oil coolers and air is introduced to the engine compartment via an air duct located on the roof. The engine bay cooling is also assisted by rear facing air extraction ducts where air is pulled from the engine bay via the rear thrust fan. The electric motor pods are powered by a collection of batteries located below the passengers much like the Tesla S. Additional lift surfaces have been incorporated throughout the frontal fender 'bridge' area. The front wing/spoiler manages to stabilize the vehicle in the air and on the ground. Standout design elements include the gull wing style doors, the front trunk, the LED head lights and rear tail lights, the exterior navigation lights for when the vehicle is in the air, stadium seating, and the passenger side steps. The gull wing style doors fully open at an 100 degree angle but also have collision detection capability that prevent any unnecessary damage. The doors are mechanically assisted during open and closing with a touch of a button and passengers can comfortably ingress and egress with a minimal door angle of 60-85 degrees from the door's closed position. The unique design and shape of the TF-X features a carbon mono-coque passenger cell with light weight supporting frame elements that span over the passengers for safety and roll over standards. The door hinges and mechanisms are found in the upper most parts of the sub frame and feature 'release blast' bolts similar to those found on the Mercedes SLS. The LED housings are populated with small arrays of xenon bulbs for the concept phase of the design. The design could easily incorporate the dual lights of several OEM offerings such as the 2014 Chevy Camaro behind the sculpted head light cover. Additionally the LED DRL(Daytime Running Lights) switch from crystal blue(currently rendered) to DOT mandated amber turn indicators equivalent to those found on Audi models. The interior design borrows its layout direction from the Automotive industry ensuring familiarity and ease of use for customers already acquainted with the interior layout of motor vehicles, and is made as light as possible. The TF-X's full capacity of four adult passengers features stadium seating, increasing visibility for the rear occupants by raising the floor and seats 8 inches higher than the front cabin area. This also allows for space for the battery cells and full tanks. The front trunk allows for 2 full sized suit cases with a little bit of room for other items. Lighting solutions for both FAA and DOT specifications have been considered and incorporated for the exterior of the vehicle as well.